• procuring a Human Resource technical advisor to assist and build capacity in the development of the plan for human resources for health. Against the backdrop of these gains, there are many challenges to meeting the health needs of the population. • increasing levels of chronic non-communicable diseases and related complications. The Ministry has been utilising a health systems approach to addressing healthcare issues in the country. This approach was clearly articulated in the Ministry’s National Strategic Plan for Health 2006-11. The plan seeks to address weaknesses in the healthcare system, and is guided by the principles of the Primary Health Care Approach (equity, solidarity and ethics) to ensure that the health system responds more effectively and efficiently to the needs of the population. Strengthening the health system will provide the Ministry of Health with the tools to assess, design, monitor and sustain an effective and efficient sectorial response to the health needs and health challenges of the population. Environment: The most significant environmental issues are deforestation and soil erosion, particularly in the north of the island. 181,000 (2012); 17 per cent of people live in urban areas. The population growth rate stood at 1.2 per cent p.a. between the years 1990 and 2012. In 2012 the birth rate at 16 per 1,000 people (41 in 1970) and life expectancy was 75 years (64 in 1970). 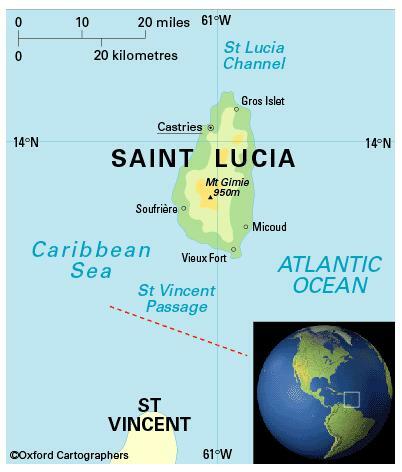 Saint Lucia’s population is mostly of mixed African and European descent. Saint Lucia is classified and an upper-middle-income economy by the World Bank.